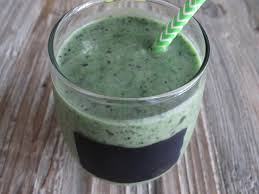 Happy Monday Everyone, what a better way to kick start the week (After Choos And Doos Fitness Week) then having a glorious tasty smoothie that not only is great for you but helps promote healthy looking skin. Add all the ingredients together in the blender and blend until your smoothie has a smooth and creamy texture. Pour into a very large glass and enjoy! You may need to pour into 3-4 glasses depending on how much you make. But this is a hearty drink to enjoy for breakfast or lunch. Drink slowly and enjoy. It’s so much healthy goodness in a glass! It’ll keep you full for a few hours. Bananas are rich in potassium and Vitamin C which are both beneficial to overall health and beautiful skin. The bananas should be spotty on the skin before eating because the spottier the banana peel is, the sweeter the actual banana will taste. Super ripe bananas are much easier for the body to digest as well, which aids in removing waste and toxins from the body at a quicker rate. Blueberries are rich in fiber and contain Vitamins A and C. They are also loaded with antioxidants (all fruits are!) and the combination of all this wonderful goodness in blueberries can help skin repair itself, whether you are suffering from acne, scarring, broken capillaries, or blotchy skin. Spinach is loaded with antioxidants and minerals including protein, iron, calcium, Vitamin A, Vitamin C, Niacin, Phosphorus, Thiamin, Potassium, and Magnesium, just to name a few. Eating spinach will help reverse the damage the sun’s UV rays do to your skin, while Vitamin K and Folate help clear your skin of pimples. Avocado contains all the essential amino acids and all the essential fatty acids your body requires and will literally leave your skin glowing when added to your daily diet. You don’t need to add avocado to your morning smoothie but it is delicious since it has a light flavor and also adds a lovely creaminess to the smoothie. Raw cacao powder is packed with antioxidants and fiber to help aid in great digestion as well and will leave your skin glowing when the toxins and waste are removed. Coconut water and filtered clean water will keep your skin hydrated and moisturized so make sure you drink one of these throughout the day, not just in your morning smoothie! Love this! Let me know what smoothie you had! There is nothing better plus healthy!! Mmmm….that s a good smoothie….used to drink some close recipe….with some maka powder….and the pulp of a fresh coconut….nice blog!! !